potentially nervous: Born Again bunnies. Welcome to the Church of Blessed Bun, with Pastor Nuage and Deacon Bells. We are a non-denominational parish devoted to peace, love and fresh greens daily. Services are open to the general public at least once a week, possibly twice if we're feeling particularly inspired. ooooooooooh does this mean you are on the trip!? Yay! Go Nuage and bells! Enjoy the ride. Had you on my mind. They should pay you for this photo. so so so happy to see the boys. My two babies haven't got religion yet. 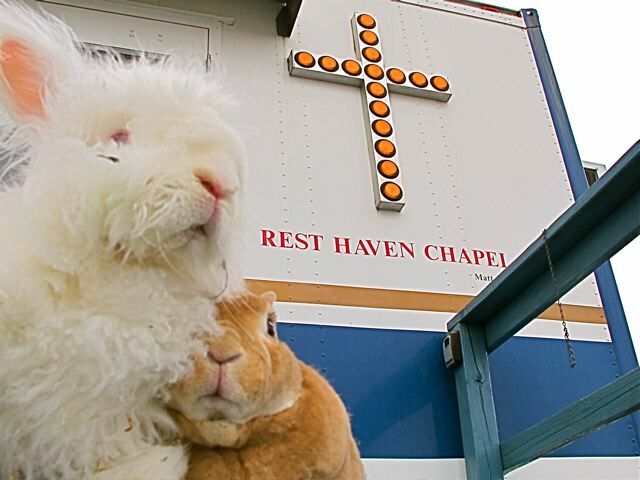 I'm pretty sure they are pagans, what with all the bunny luv'n. But what news? Where are you happy campers? Ahhhhhhhhhhh, that's a great pic but where's the update on your cross country adventure? !